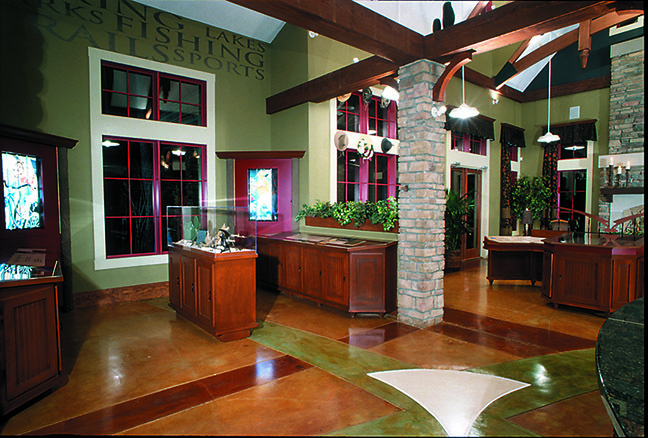 Eagle Springs Sales Center - Marketing Specifics, Inc.
Terrabrook developed this 1,360-acre masterplanned community in Katy, TX, with the first-time buyer in mind. The attention to detail within Eagle Springs, especially within the selling environment, draws buyers to the community. Once you walk through the doors of the sales center, you’re instantly drawn in. The bold wall colors, stained concrete floors with the cut-in logo and impactful graphics, hold your attention. The reception desk and displays have been designed with nature in mind and have been incorporated with faux tree bark that looks impressively real! Large banners were peppered throughout the periphery of the sales center and attached to the walls with rope – again, in keeping with the natural environment that has been designed. 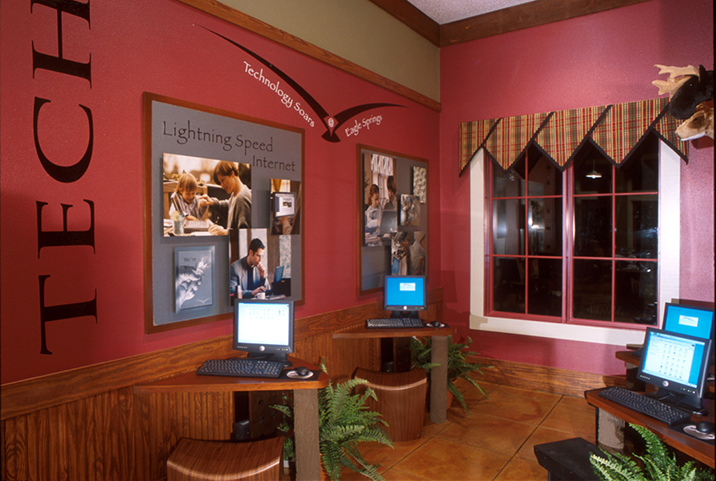 Copper accents, such as a custom-made waterfall, site table detail and fireplace screen, all feature the Eagle Springs logo; thus continuously reinforcing the community within the selling environment. A refreshment area, lap lane, kids’ area, conference room and agent office has also been incorporated within this environment to provide agents the tools needed to work with potential homebuyers and their families. All of the design details cohesively came together for this community sales center, that is truly an eye-catching experience.